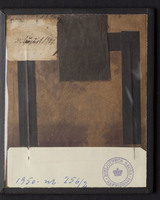 Brown/white paper label on back, handwriting in black ink: "31 August 1849"
Conserved in 2006. Cover glass was missing and a new has been put on. Resealed with Lineco frame sealing tape. 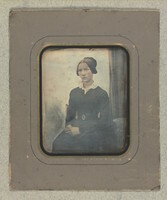 A piece of polyester the size of the mounting is placed on the back and held together with the rest with black coloured Lineco frame sealing tape.